A special Thank you to Bonneville Books for sending this book for review. If you like The Bachelor or reality TV then you'll love Countdown to Love. It has a hometown southern feel to it which makes it come to life. Feel much more real. My sister lives in Jackson, WY this book gives me a feeling of what it is like to live there. The author paints a very vivid picture and makes me want to live in a small town. It is a really fun summer read. One you will believe and enjoy. I like character development a lot and you see the changes in Kelly and Dillon. I like coming of age stories where you can see the difference in someone through the trials they've been through. This is one of those. There are also a lot of laugh out loud moments that had me waking my husband up in the middle of the night to tell him a funny line or two. If you are looking for a clean romance then this is it. 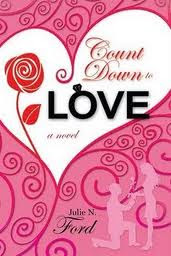 I really like Julie Ford's plot for Countdown to Love! And a CLEAN book, to boot! Thank you, Julie! This sounds like a fun read, great review! Crazy that your sister lives in Jackson. That is where I grew up!